It's important to ensure that your customer service team is knowledgeable, friendly and engaged with your customers. Improving customer service is the most important aspect of improving your relationships with your customers. Research indicates that when a customer has a positive experience with your business they will discuss this experience with two to three other people. However, if they have a negative experience they will share information about this experience with over ten other people. With this in mind, it is essential for your business that you understand your customers' needs, provide incentives and positive surprises for your customers, invest in service training for your team members, make sure you adhere to high standards when it comes to customer service, showcase great examples of customer service internally and publicly, improve paths and streamline processes for your customer, recruit the best staff for customer-focused service roles, and seek out feedback from your customers. 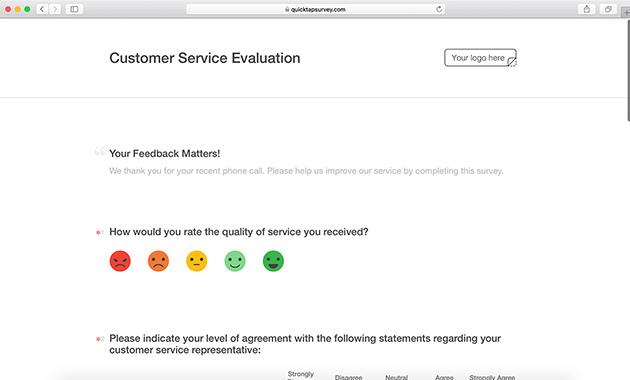 QuickTapSurvey is a powerful, fast and easy tool that can help you collect and analyze customer feedback to take real action with your results. 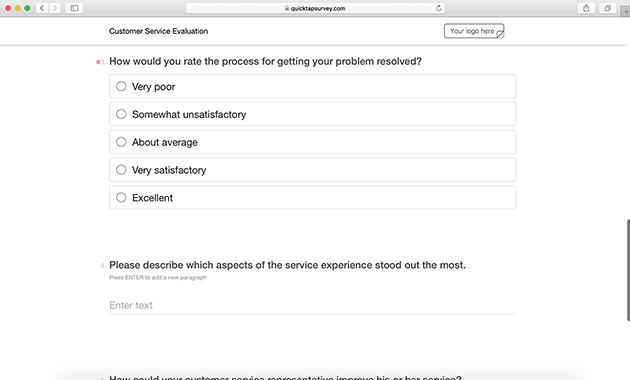 All you need is the QuickTapSurvey application and a tablet or mobile device to build a beautiful and usable customer feedback survey and start collecting feedback in minutes, with or without an internet connection! 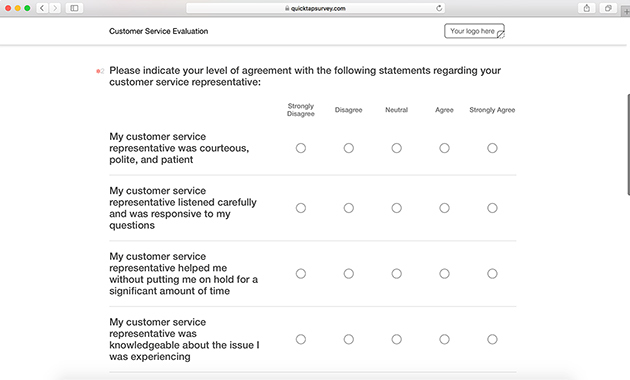 This customer service survey template can help you improve customer service practices by reviewing recent experiences with your customers. Please indicate your level of agreement with the following statements regarding your customer service representative. My customer service representative was courteous, polite, and patient. My customer service representative listened carefully and was responsive to my questions. My customer service representative helped me without putting me on hold for a significant amount of time. My customer service representative was knowledgeable about the issue I was experiencing. My customer service representative was able to solve my issue, or transferred me to the appropriate person to solve my issue. 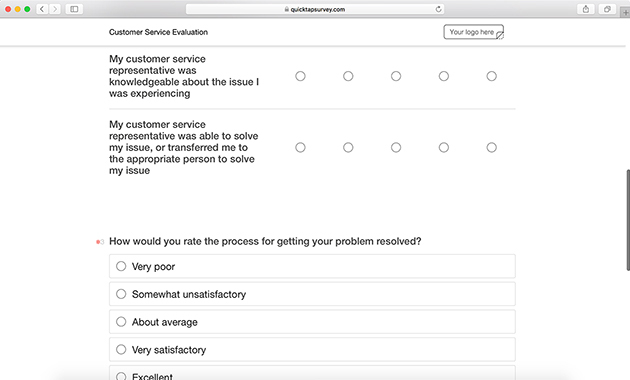 How would you rate the process for getting your problem resolved? Please describe which aspects of the service experience stood out the most. 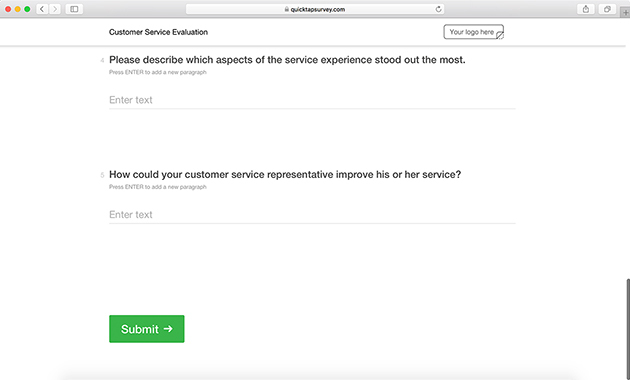 How could your customer service representative improve his or her service?